It's just another day people! Move on, nothing to see here, come on, move along... the sun will come up tomorrow just as it did yesterday. If you didn't lose that ten kilos or make that extra thousand dollars or you weren't a better person during the course of last year, odds are you won't do it next one either, so don't kid yourself by making any resolutions. 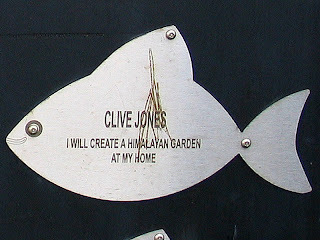 Or maybe, like Clive Jones presumably of Newport, Wales you would like to build a Himalayan Garden, and don't think you'll remember to do it without a public reminder fixed to a derelict piece of fencing near a rarely used transporter bridge. It seems that British iTV declared a "decade of promise" starting at the beginning of the new millenium, and this prompted hundreds, if not thousands of people to think of something they'd like to achieve in the ten years that were to follow, and have same engraved on a stainless steel fish mounted in various locations throughout Britain. Seven years into the ten, I have so far failed to find any evidence of any progress on any of the promises so prominently displayed. I've even sent a message to someone called the Ferret at iTV to see if he/she can assist, but so far this too has been to no avail. I have no idea what compelled people to make their promises so public, committing themselves to act in a particular way or undertake projects for an entire decade, nor why they chose to write them on a fish, but as far as I can tell it was all for show, just another set of resolutions forgotten by all except the venerable accidental tourist. For that matter, it's impossible for me to fathom what one actually does with a Himalayan Garden when one has one. Is it a place to set up a mock base camp, to enable one to dispose of empty oxygen cylinders and dehydrated food containers? Having spoken with a number of people who have actually been to the Himalayas, it appears that gardens rarely appear on the travel brochures for a very good reason. Gardening in the Himalayas it seems, is such a rare occurance, that to date there are no actual recorded instances of it actually having occurred. Perhaps indeed that is why Clive has set out to create his Himalayan garden in glorious Newport, where there's no sign of any other sort of garden either, and therefore no risk of serious critique. I've searched high and low to see if I can find any evidence of success, failure, or even a hint that Mr Jones actually exists, but not even the Ferret can help it seems. Perhaps Clive's home is actually in the Himalayas, in which case the question of why he would travel to Newport to make such a serious commitment weighs heavily in the whole equation. Clive, if you happen across this post, if you'd be kind enough to fill us in on progress we'd all appreciate it. In the absence of a metal fish, if you feel compelled to a make a public display of resolve for the benefit of the New Year, please feel free to relieve yourself in the comments column below. Have Happy New Year and a truly fantastic 2008! 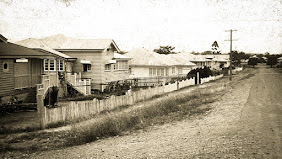 I promise to put a people counter on my blog- with the help of my father. Hmmm, you get them in the Himalayas you know.